I see something happening, and I want to be a part of it! I can’t help myself. While this is all well and good most times, sometimes I’m too helpful with my suggestions. How to cut something properly, what knife is best, what ingredient to add, how to clean something, what product to use, the list goes on… On this particular day, it was cleaning commentary that tipped me from being helpful, to being annoying. In an effort to curb any further irritation, I put myself on lockdown in the basement, and got on with my workday. Hours pass, and my stomach is beginning to grumble, I realize it’s time to re-surface. I cautiously make my way upstairs, relieved to find Shan in the kitchen, whipping up not just one, but two salads! HALLELUJAH! SHE STILL LOVES ME! Not only was she whipping up two delicious salads, she was doing so in the lovely ceramic bowls I purchased the day before. I warily suggest taking a photo (because I was excited about the bowls, and the salad looked wonderful), and Shan says “sure”. Slightly pushing my luck, I make a few suggestions for the salad (poaching some eggs, and sauteeing the mushrooms she had sliced), and get busy setting up a quick photo. Walking on thin ice, I make quick work of the photos, and we get to eating lunch. 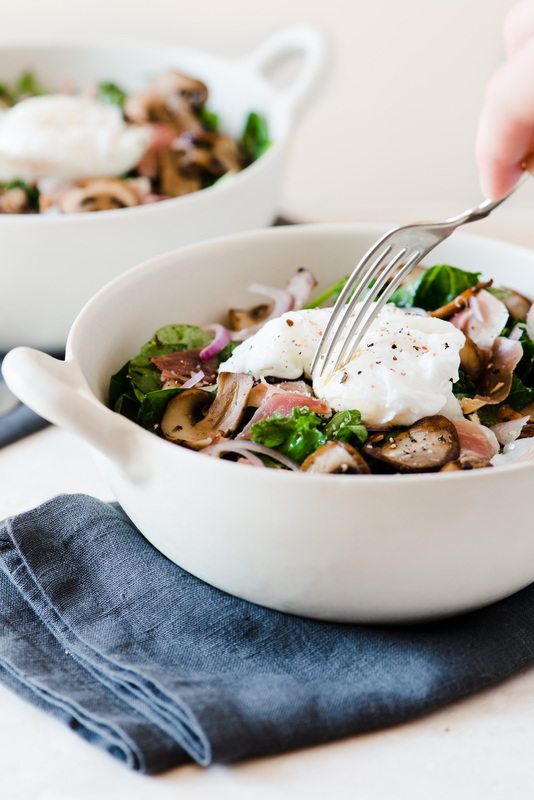 A satisfying mix of Kale & Spinach, topped with mushrooms, prosciutto, artichokes, and more. Combine ingredients for vinaigrette, whisk until emulsified. In a pan on medium heat, add butter, once heated, add mushrooms, sauteeing until browned. Boil a pot of water, once boiling, reduce heat to a gentle boil, poach eggs for about 3 minutes, removing with a slotted spoon. In a large bowl, combined chopped kale leaves, and spinach, toss with dressing. Add almonds, parmesan, shallots, prosciutto, artichoke, and mushrooms. Gently toss. 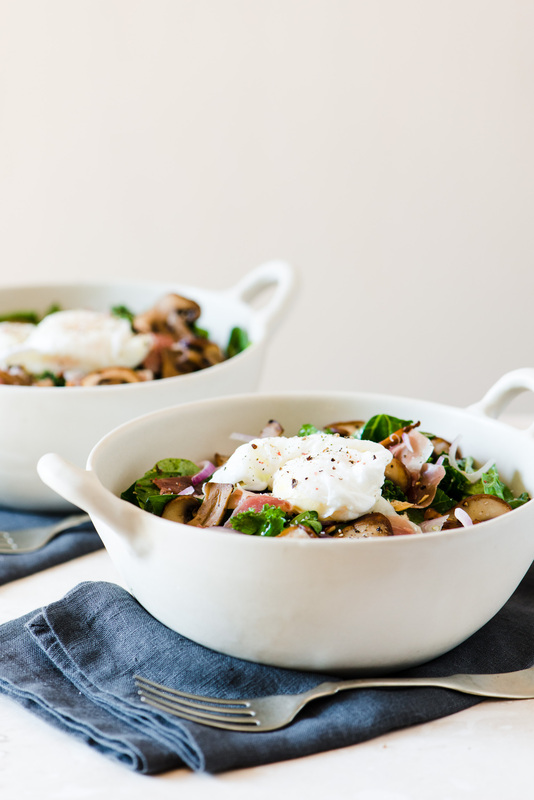 Serve in bowls, topping salad with poached egg, salt & pepper. This was one of those salads inspired by leftovers in the fridge (which is often the case). 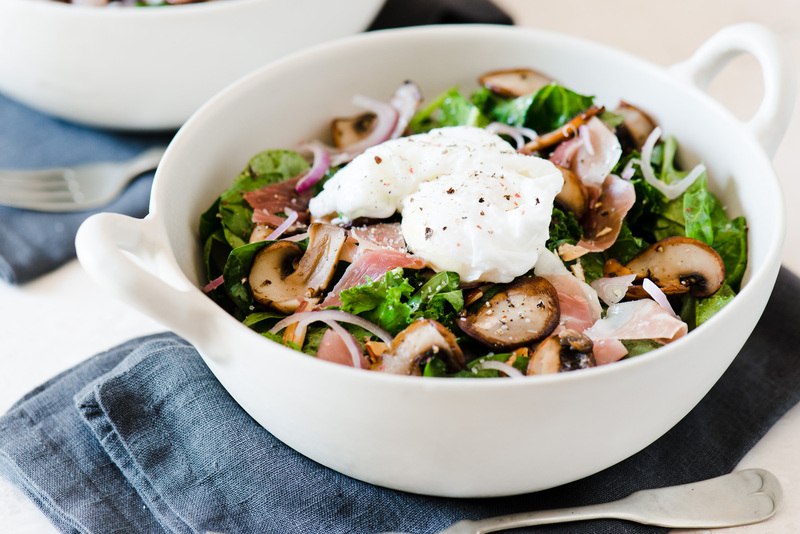 A satisfying mix of kale and spinach, tossed with a simple lemon vinaigrette, and important things like artichokes, mushrooms, prosciutto, and poached eggs. It was an extremely satisfying salad, possibly made even more satisfying, thanks to my hunger, the new ceramic bowls, my jubilation that Shan didn’t want to leave me, or because everything Shan put in it was amazing (especially the secret inclusion of artichoke oil).